Letting Entertainers Control Your Thinking? We live in a country in which we increasingly let paid entertainers do our thinking for us. As a result, we are advocating our favorite stand-ins against the entertainers we don’t like. 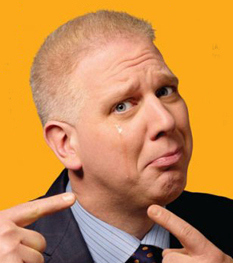 It could be as simple as watching Jon Stewart or Stephen Colbert, laughing, and leaving the whole argument as, “What you said!” Or it could be as nefarious as chewing our fingernails in fear listening to Glenn Beck (above) or Sean Hannity and going to bed angry. Remember: These people are all well-paid entertainers. They aim at a particular demographic and work on them so as to keep them coming back for more. I used to be very upset with these fake pundits, particularly those on the right. If you go back and look at my earlier postings are the tags “conservatives,” “republicans,” or “tea-party,” you will find that I had spent a lot of time getting exercised by people who were just doing what they were paid to do. Rush Limbaugh doesn’t care whether I hate his guts, no more than the actors who played James Bond villains like Auric Goldfinger or Ernst Stavro Blofeld care whether audiences detested them. These guys are all paid villains. It’s what they do for a living. To uneducated yokels who have been “left behind” in dying rural areas, they are calls to action coming as if from the mouths of angels. Scores of our fellow Americans have been killed because people with a tenuous grasp on their sanity have decided to pick up their guns and take direct action. Rush didn’t tell them to shoot anybody. Glenn didn’t do it, nor did Sean. Even Wayne La Pierre of the NRA didn’t give his blessing. They’re innocent of all wrongdoing, while these poor loonies are surprised that people not only hate and fear them (instead of showering them with candy and flowers) but want to see them receive the maximum punishment. The danger of using stand-ins to do all our thinking for us is that we could make the mistake of thinking the whole world believes in what their particular set of entertainers say. When they suddenly discover how divided we are, it could come as a serious shock. So, Democrats, watch Faux News for a while just to see the snake oil that is being sold to the feeble-minded. And wingnuts, stay up late and watch Stephen Colbert or Bill Maher just to see that people may think differently from you. Take away those blinders, and see the mess we’re in!